The most competitors in our range sell machines, produced in China or Far-East. Lava does not! Other companies in our range just sell, we live for vacuum packing 24/7. In the market for vacuum-sealers and accessories, there are many vendors, we want to present you the basic advantages of a Lava Vacuum Sealer. Simply compare the key features – because mostly a cheap at first glance product is twice as expensive afterwards. A Lava was originally designed for commercial use. The first priority of the Lava engineers was to develope handy, high-performance products, which satisfies the customers not only in the short term usage, but also in the daily, professional and longterm operation. Vacuum Sealers of Lava are popular all around the world. They have already won several awards. 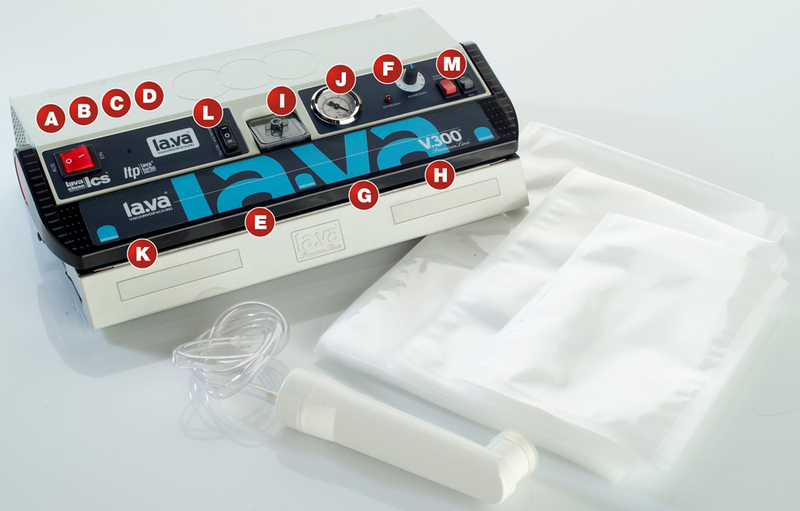 Independent reviews, product testing, and customer reviews confirm the quality of the vacuum packaging of Lava. well as in the Lava Terms and conditions. With high quality ball bearings (not sleeve bearing ...) devices of Lava Premium line even 2-fold. Lava vacuum pumps are therefore also particularly smooth-running and have consistently high performance. A maximum achievable vacuum of up to -0.96 bar for models V.100 to V.300 premium to protect your products longer and keep it fresh. The model V.500 achieves with 3 motors and 3 pumps up to -0.97 bar. Even faster work with the innovative Lava turbo pump system - Lava thus offers the most powerful vacuum sealer in this class! The turbo-pump system with a pumping capacity of up to 35 l/minute at the V.100 to V.400 is perfect for vacuuming especially large bags within a few seconds. The V.500 has 3 pumps and a pump power of 75 ltr./min. Lava guarantees up to 1,000 vacuum transactions at a time in a row without overheating! The oversized designed welding transformer built in all devices in series and not overloadable. Lava installed indestructible weld bands (no thin wires) each of which at least 4 mm wide up to 6 mm, depending on the model. The V.333 with 3-welding, for example, makes a 3 x 5mm weld. The welding time can be adjusted smoothly and set it perfect for all types of foils, no matter whether that is a thin chip bag or a 200µ industry foil. Lava offers 1-, 2-, and 3-fold welding. Especially popular are the models of lava Premium Line (V.100 to V.300) with standard 2-welding. The more welds a device has the higher the shutter security is, especially for products with a slightly elevated amount of liquid such as meat or fish. Up to 1210 mm weld length for the most popular models V.100 to V.500 or V.300. 35 cm length allow a flexible use. A removable liquid separator, only in a Lava: it protects the pump effectively against the penetration of liquids - the separator can be simply removed and emptyed in a Lava (V.100 to v.333). Precisely adjustable vacuum pressure - it's only available in a Lava. No more squeezed sensitive goods. No more expensive vacuum bags! Vacuum sealing in low-cost standard vacuum bags (from 120µ) is possible with a Lava through the unique bag-stop bar and the high welding performance of the large welding transformers: Leave the sealed bags above and below the overlap stop bar set to close the unit - the vacuum process takes a little longer but the quality of the vacuum and the weld is perfect. A switch for vacuum sealing of bags or cases. The need for case suction device is already included as a standard with each device. Sensor-controlled manual and automatic vacuum sealer, sealing and welding process (from V.200). It is always possible to manually initiate the welding process. In the market for vacuum packaging, there are many providers. Here we tell you once again with an interactive image of the Lava V.300 the essential quality features and functions of a vacuum devices of Lava. Procedure: Please just move your mouse over the "marked points" and the text message appears. Lava as a manufacturer stands of 100% behind our own product - you will receive upon all Vacuum Sealer up to 5 years warranty (an extra charge when ordering). The warranty covers all electrical, moving parts such as the Vacuum Sealer pump, transformer, electronic circuit board or counter. Wear parts such as seals or welding band tapes of them are the exception.